I have to say this though. When the interviewer asked if you truly expected to change people’s minds with the debate, you said no, that you were going after the mushy middle. But there have been scores of really, fervently pro-choice people who have had a profound conversion and become fervently, actively prolife. That’s just off the top of my head. The conversions tend to go from prochoice to life on this issue. How many people can the pro-choice movement say they have converted to their cause with their stellar logic and top notch arguments? 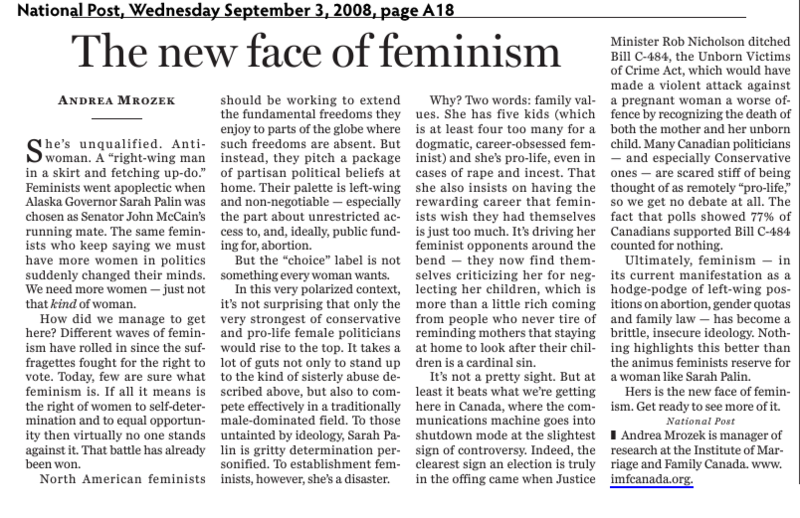 How many past leaders of the Campaign Life Coalition now actively fight for what they call “women’s rights”? The best I can think of are a couple of renegade nuns, and it is dubious whether they actually were ever prolife to begin with. Excellent interview, and I must also compliment the program host on his asking intelligent questions. Veronique was calm, articulate and reasonable, while Ms. Arthur was out-of-breath, defensive and angry. She spent most of the interview lambasting the pro-life movement–a lame tactic indicative of desperation. I am still puzzled as to how a aborting a fetus is supposed to empower a woman and be an exemplify women’s rights. Thank you Melissa and Brigid! You give me the perfect opportunity to clarify a few points that I didn’t have time to make eloquently! The first-ish question about whether Parliament is the right venue for an abortion debate, I said something amounting to no. In reality, I think that Parliament is as good a place as any to have a debate on abortion. However, by nature of it’s function, Parliamentary debate is limited to legislative issues and I don’t believe that Canadians have the appetite for a legislative debate on abortion. You can fault Stephen Harper for many things but not for misreading what will get him elected: his abhorrence to broach the subject reflect the mood of the electorate. Legislative change can be the leader of a change in public opinion but I don’t think this will happen for abortion. Also, I was discouraged by a tweet from a Liberal MP I follow on Twitter that said something like (paraphrasing): “There is plenty of room for pro-life Liberals… in the Conservative caucus.” Abortion is a matter of science mixed with ethics and morals. It has nothing to do with whether you hang left or right. Divided along party lines, there is not much point in debating abortion in Parliament. Just my opinion, of course. In terms of convincing people, what I meant was that convincing is not my gift. I am not a debater. Moreover, I think that convincing happens in the heart, mind and soul and that people — including the ones mentioned in Melissa’s comment — convince themselves. We need to get the arguments and the science out there, for sure. But we can’t make “convincing” a measure of our success: we have to do what we do regardless of whether or not we succeed at a given point in time.